Do you have a minute to spare to learn some English? 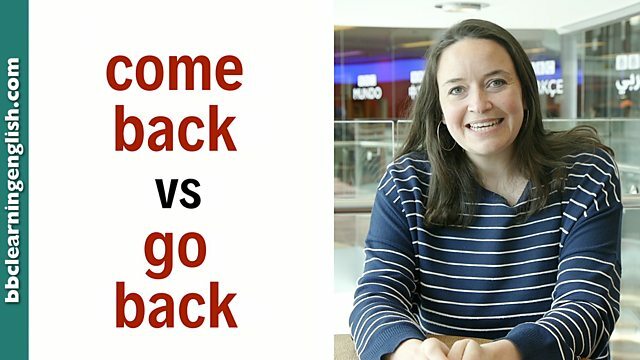 Here's Sam to explain the difference between come back and go back! Give us 60 seconds and we'll give you the English! Welcome back to BBC Learning English! I’m Sam and today we’re looking at the difference between come back and go back. They both mean to return, but we use them differently. We use come back when we return here. So, for example: I am in the BBC building now. Tonight I will go home, and tomorrow I will come back here - like a full circle. So, please come back to BBC Learning English for more videos! When you come back, you leave and return to here - the place where you are when you speak. I need to leave, but I'll come back in 15 minutes. Get out of my house and don't come back! I'm sorry, she isn't here. But she's coming back tomorrow. When you go back, you return there - to the place you were before. I've had a lovely time, but I should go back home now. There are only three more days before our holiday ends and we have to go back. Stop stealing or you'll go back to prison. Is this person returning to this place? I like it here, but I'm out of time and need to leave. Maybe we can ______ tomorrow? Is this person leaving to return to this place later? I've left the children with my sister, but I can't be long. I need to ______ as soon as possible.